This article is about the entertainer. For the single by Sasha, see Wavy Gravy (instrumental). Hugh Nanton Romney (born May 15, 1936), better known as Wavy Gravy, is an American entertainer and activist for peace, best known for his hippie appearance, personality and countercultural beliefs. His moniker was given to him by B.B. King at the Texas International Pop Festival in 1969. "It's worked pretty well through my life," he says, "except with telephone operators – I have to say 'Gravy, first initial W.'"
Romney was born in East Greenbush, New York on May 15, 1936. As a child, he took walks around the block with Albert Einstein. He attended William Hall High School in West Hartford, Connecticut. In 1954, Romney volunteered for the military and was honorably discharged after 22 months in the United States Army. Under the G.I. Bill, Romney entered Boston University Theater Department in 1957 and then attended the Neighborhood Playhouse for the Theater in New York City. In 1958, he began reading poetry regularly at The Gaslight Cafe in Greenwich Village. He eventually became the cafe's entertainment director, befriending musicians such as Bob Dylan, Tom Paxton, and Dave Van Ronk. The Hog Farm collective was established through a chain of events beginning with Ken Babbs hijacking the Merry Pranksters' bus, Further, to Mexico, which stranded the Merry Pranksters in Los Angeles. First Romney assembled a collective in North Hollywood, visited by the likes of musicians such as Tiny Tim whom he managed, and Ravi Shankar. After moving to Sunland, a suburb north of Los Angeles, he was evicted from his one-bedroom cabin when the landlord found out that a large group of assorted pranksters and musicians were staying there. Two hours later, a neighbor informed Romney that a nearby hog farm, owned by Claude Doty, needed caretakers. Romney accepted the offer and worked the farm in exchange for rent. Local people, musicians, artists, and folks from other communes began staying at the mountain-top farm. In his book Something Good for a Change, Gravy described this early period as a "bizarre communal experiment" where the "people began to outnumber the pigs". Both Romney and his wife, Bonnie Beecher, had jobs in Los Angeles. He worked for Columbia Pictures teaching improvisation skills to actors. Bonnie was a successful television actress, appearing in episodes of The Twilight Zone, Gunsmoke, Star Trek, and The Fugitive. Gravy called his group the "Please Force," a reference to their non-intrusive tactics at keeping order, e.g., "Please don't do that, please do this instead". When asked by the press — who were the first to inform him that he and the rest of the Hog Farm were handling security — what kind of tools he intended to use to maintain order at the event, his response was "Cream pies and seltzer bottles" (both being traditional clown props). In Gravy's words: "They all wrote it down and I thought, 'the power of manipulating the media', ah ha!" Gravy has been the Master of Ceremonies, and the only person to appear on the bill of all three Woodstock Festivals. Throughout the festival, Gravy made several announcements from the concert stage. He later wrote in his memoir that "the reason that I got do to all those stage announcements was because of my relationship with Chip Monk [sic]. Chip built the stage at Woodstock." On the morning of the 20th Anniversary of the Woodstock Festival, he was interviewed — along with Ken Kesey — live on Good Morning America at the Bethel concert site, where he discussed his experience as the MC of the event. Gravy's first appearance at an event in the Neo-Pagan community was at the WinterStar Symposium in 1998 with Paul Krassner. [not in citation given] He appeared there again in 2000 with Phyllis Curott, where he joined Rev. Ivan Stang in a joint ritual of the Church of the SubGenius and his Church of the Cosmic Giggle. With hundreds of men being detained (women were held separately) in the "Hotel Diablo" – actually the old gymnasium at Cuesta College in San Luis Obispo, California – after arrests during the September 1981 Abalone Alliance-organized anti-nuclear protest, trespass/occupation and civil disobedience action at Diablo Canyon Power Plant, Gravy organized and acted as MC for a variety show that he called the "Tornado of Talent" which featured, among other performers (and after the guards had allowed an acoustic guitar to be brought into the "jail"), Jackson Browne. Wavy arrived at the holding facility dressed in a pair of bright green coveralls. After settling into his "bunk" (a thin mattress on the gym floor) he removed the coveralls to reveal a Santa Claus suit. Gravy established the store Nobody's Business across the road from the Hog Farm, reminiscent of his "Nobody for President" campaign — as in: "Who's in Washington right now working to make the world a safer place? Nobody! "; "Nobody's Perfect"; "Nobody Keeps All Promises"; "Nobody Should Have That Much Power"; etc. The joke had previously been used in the 1932 short film Betty Boop for President. The "Nobody for President" campaign held a rally across from the White House on November 4, 1980 that included Yippies and a few anarchists to promote the option of "none of the above" choice on the ballot. After criticizing Jimmy Carter, Ronald Reagan and John B. Anderson, the committee offered the "perfect" candidate: Nobody. "Nobody makes apple pie better than Mom. And Nobody will love you when you're down and out," Gravy told a crowd of 50 onlookers at the rally. Early on, he shared an apartment with singer-songwriter Tom Paxton in Greenwich Village for a time, and Romney was one of Bob Dylan's earliest friends in New York City. One of Bob Dylan's girlfriends from the University of Minnesota, Bonnie Beecher, now Jahanara Romney, married Gravy on May 22 1967. They have a son, Jordan Romney (born in 1971 as Howdy Do-Good Gravy Tomahawk Truckstop Romney). Romney has stated that he has no familial relationship with the Romney family of American politics, which includes George W. and Mitt Romney. Two weeks after Woodstock, at the 1969 Texas International Pop Festival Romney was lying onstage, exhausted after spending hours trying to get festival-goers to put their clothes back on, when it was announced that B.B. King was going to play. Romney began to get up; a hand appeared on his shoulder. It was B.B. King, who asked, "Are you Wavy Gravy?" to which Romney replied "Yes." "It's OK; I can work around you,"  said B.B. King, and he and Johnny Winter proceeded to jam for hours after that. 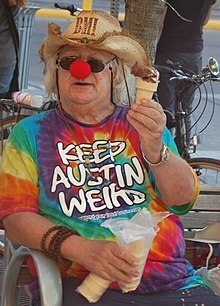 Romney said he considered this a mystical event, and assumed Wavy Gravy as his legal name. Wavy Gravy Retrospective (1996) at the Firehouse Gallery of Bordentown, NJ. Gravy in Your Ear: Gravy's radio show airing on the 15th of each month on Sirius Satellite Radio, with several re-broadcasts. ^ a b Michael E. Young; Roy Appleton (August 30, 2009). "Texas International Pop Festival was full of surprises for artists, fans, onlookers". Dallas Morning News. Retrieved May 15, 2010 – via Janis joplin.net. ^ "Arts Days". The Kennedy Center Arts Edge. Archived from the original on April 1, 2007. Retrieved April 15, 2018. ^ a b c Corey Deitz (June 19, 2018). "Sirius XM Satellite Radio Personalities". Lifewire. Retrieved July 29, 2018. ^ Holden, Stephen (December 7, 2010). "The Hippie Serving Peace and Breakfast". The New York Times. Retrieved January 11, 2011. ^ Frank Scheck (December 9, 2010). "Saint Misbehavin': The Wavy Gravy Movie -- Film Review". The Hollywood Reporter. Retrieved April 15, 2018. ^ Peter Hartlaub (December 3, 2010). "'Saint Misbehavin': The Wavy Gravy Movie' review". SFGATE. Retrieved April 15, 2018. ^ "????". The Village Voice. Archived from the original on June 30, 2013. Retrieved April 15, 2018. ^ Van Laarhoven, Kaspar (December 28, 2016). "The Story of The Gaslight Cafe, Where Dylan Premiered 'A Hard Rain's a-Gonna Fall'". Bedford+Bowery. New York Magazine. Retrieved August 9, 2018. ^ Zekley, Mickey (1995). "The Hog Farm Blues". The Adventures Of A Street Musician – Part One. ^ Wavy Gravy (1992), p. 229. ^ "Black Oak Ranch History". Kate Wolf Music Festival. Retrieved January 23, 2016. ^ a b Wavy Gravy (1974). The Hog Farm and Friends. New York: Links Press. pp. 72–74. ISBN 9780825630149. OCLC 947606. ^ New Yippie Book Collective (1983). Blacklisted News: Secret Histories from Chicago, '68, to 1984. Bleecker Publishing. ISBN 9780912873008. ^ Wavy Gravy (1992). Something Good for a Change: Random Notes on Peace Thru Living (1st ed.). New York: St. Martin's Press. ISBN 9780312078386. OCLC 25367907. ^ "The Psychedelic Era". The Rock and Roll Hall of Fame and Museum. Archived from the original on September 5, 2007. ^ "Seva's Board of Directors". www.seva.org. Seva Foundation. Retrieved July 29, 2018. ^ "California overnight summer camp for kids and teens". Camp Winnarainbow. Retrieved April 15, 2018. ^ Dominick A. Miserandino. "Wavy Gravy 1960's icon and activist". TheCelebrityCafe.com. Archived from the original on January 1, 2006. Retrieved July 29, 2018. ^ "On the Towns; Going Out". The New York Times. April 4, 1999. Retrieved October 24, 2012. ^ "Nobody for President, 2020 [Official Pages]". www.nobodyforpresident.org. Retrieved April 15, 2018. ^ Wavy Gravy (Winter 1988). "20th Anniversary Rendezvous - Wavy Gravy". WholeEarth.com. Whole Earth Review. ^ "Bonnie Beecher". IMDb. Retrieved April 15, 2018. ^ "Hugh M Romney & Bonnie Beecher, California Marriage Index, 1960-1985". Family Search (Transcription of public record.). California Department of Health Services, Sacramento. November 27, 2014. Retrieved November 17, 2018. ^ Interview[who?] on Late Night with Jimmy Fallon, 26 May 2011. ^ "About - Wavy Gravy". wavygravy.net. Retrieved April 15, 2018. ^ "Village voices". lpcoverlover.com. July 12, 2008. Retrieved April 15, 2018. This page was last edited on 24 February 2019, at 16:56 (UTC).